Discussion in 'MORE TERRY PRATCHETT NOVELS' started by JAK, Aug 7, 2013. To my mind it’s not very Discworldly and the image is too similar to something that took the Roundworld’s industrial revolution 100-150 years to evolve into, so with Moist as the main character I can’t get to grips with how this will have happened virtually overnight – It’s not as if the paddleboats of Snuff had a primitive form of steam power that could have been perfected - hopefully the book will full explain. I see Waterstones are to get a different book cover – looks like the outside of a compartment of a non-corridor railway carriage with the same goblin hanging out of the window. Still hoping the steam engine and carriages in the book will be a little more primitive than the examples Paul has used to base his paintings on. The alternative cover as advertised at Waterstones – but is it as the goblin and ‘driver’ appear to have been cut and pasted directly from the original cover. Ordered book received from Waterstones – it has the railway carriage cover as above, as do all the ones on their shelves which are now only £4 off. As stated before the goblin and head are just cut and pastes from the original cover painting, including the glare from the fire! 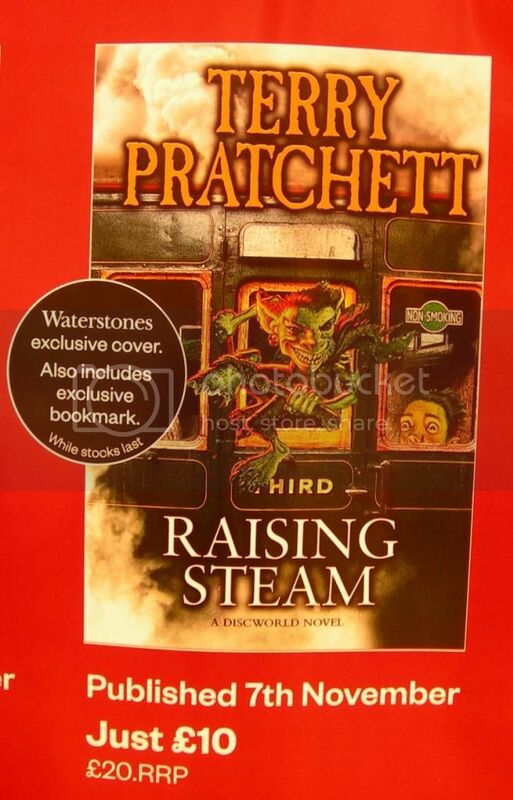 The left hand side of the carriage is empty on the front but on the version printed on the back there is an appalling photo of PTerry there and the goblin is covered by an image of the travel ticket which is taken from the free bookmark. A redeeming feature is that the actual book hardback covers have the original cover painting printed on them, in reverse on the back, without any title or other overprinting. Just finished reading and overall I liked the book but my initial doubts about the speed of the introduction of steam travel were not really quashed; which is unfortunate because the means to do so were there – there just wasn’t anything written to confirm this had happened. There was the hint of a magical or living element at the start of the book and with the goblins making improvements to the clacks system I would have liked a ‘Tailor of Gloucester’ moment while Girder was just circling Harry’s yard to give credibility to the dramatic advancements that despite great amounts of money would have required much more time to perfect and progress. I also felt it was written a bit like Dodger in that just about every known cliché, railway (rather than London), was thrown into the story (although I don’t remember the damsel chained to the tracks by her wicked uncle) - not that I mind this. We have the accept all that life throws at us so if there are two lifetimes worth of ideas rattling around in one’s head better they come out in a rush than be lost. As a model maker I’m sorry that this book was written as it marks the end of the Discworld I know and love. Steam power and an industrial Revolution, as here, will cause major changes to the way people think and act – I liked the fantasy setting of a blend of a little beyond medieval but not quite Victorian. I can see the next book, certainly if set in AM, being closer to the steam punk genera, possibly with Moist explaining to Vetinari why the AM Gas and Electric Co. need to increase their charges by 30% each year and that he should be lowering rather than raising taxes. Right, now time to read again to see what I missed or didn’t get first time round.